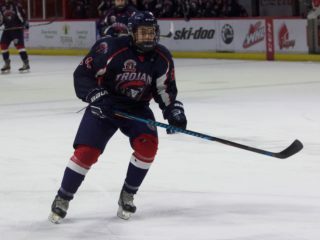 (Marc Smith/DiscoverMooseJaw) This summer featured a lot of big career steps for Moose Jaw Warriors defenceman Jett Woo and another one is on the horizon this week. Woo is off to training camp with the Vancouver Canucks this week, his first with the team after being selected in the second round of June’s NHL Draft. It was a whirlwind summer for Woo as he was selected by the Canucks with the 37th overall pick in June; spent time at the team’s development camp and Hockey Canada’s World Junior Summer Showcase in July; then started to prepare for the upcoming season with the Warriors over the past few weeks. 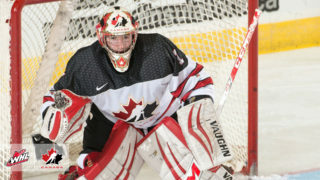 Woo is now making his way out to British Columbia for his first training camp in the Canucks’ organization. “It’s going to be fun,” said Woo. 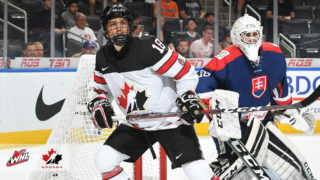 “I’m going to take everything that I learned my first time going there (for the Canucks’ development camp in July) and at my first World Junior camp and show them that I’ve improved, both on and off the ice. 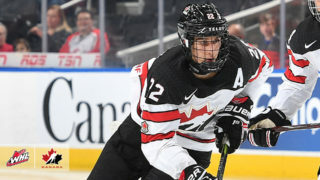 While it’s unlike that an 18-year-old second-round pick is going to crack the Canucks’ NHL roster, Woo is going into training camp with the mindset that he’s going to make the team, while also seeing how he stacks up against the pros. “I have a couple of buddies that have been through the process and have told me how fun it was, so I’m looking forward to this and I’m going to try to do the best that I can,” said the Winnipeg product. All that will help Woo become a better player heading into his third season with the Warriors this year. Woo finished with nine goals and 25 points in 44 games during an injury-plagued season in 2017-18. Defensive depth is the strength of the Warriors this season with Woo helping to lead the way. He said he’s looking forward to the year ahead. Woo and the Canucks take the Winnipeg Jets on Friday and Sunday as part of the 2018 Young Stars Classic in Penticton, B.C.